Hybrid travel trailers offer protection of hard-sided campers, a lot of space, fuel economy thanks to lightweight design and bedrooms from canvas under the stars…. In today’s world, as lifestyles begin to morph and change, one theme that stands out is that of economy. And there’s no better economic style of camper than a hybrid travel trailer. With a very sturdy body, these trailers make use of every inch of space, all while being well-priced, light, and easy to tow. 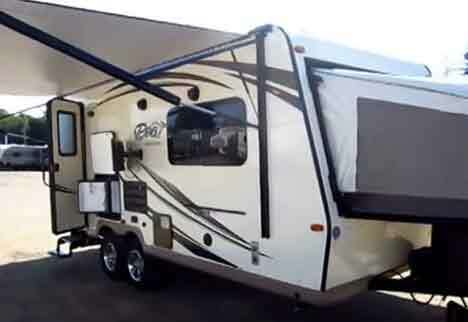 Hybrid travel camper trailers have many similarities to other campers and RVs. 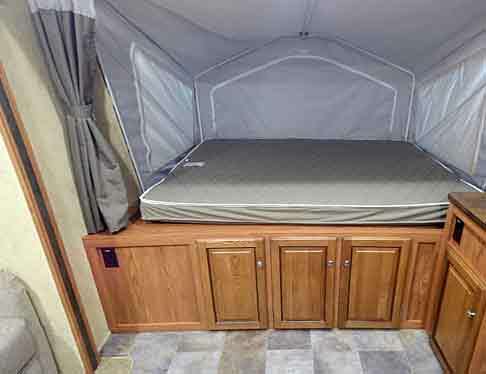 They offer the protection, safety, and climate control of hard sided campers. However, the hybrid versions also come with retractable bed areas. These bed areas extend like those in pop-up campers, sliding out from the main body of the trailer. This provides extra space in the trailer area, because the beds aren’t built in to the main body. Another concern campers have when considering what shelter to purchase is space. While it’s nice to think that there are very few needs when out in the wild, when people begin putting things together, they soon discover this isn’t the case. Even spacious RVs tend to get crowded easily as they’re packed full of supplies, equipment, and people. Hybrid trailers are unique in that the bed areas are separate, leaving the entire center section of the trailer free and empty. There is typically plenty of storage space in this area, as well as seating for everyone. Finally, hybrid trailers are much lighter than the typical camper. This is due, in part, to the pull out beds. Instead of having heavy bed sections, hybrid beds are made with a slab of wood and a mattress. While this is still extremely comfortable, it also decreases the amount of weight the trailer has overall, making it easier to tow. Not only will this save on gas expenses, it will also open up more travel opportunities. While hybrid travel trailers are great campers, being easy to use and well-priced, there are a few things that should be taken into consideration before purchasing one. The first is the care of the canvass. Because this is the only fabric section of the camper, it needs to be monitored and cared for very well. It should be checked for mold and wetness before being folded back into the trailer. Owners should treat and waterproof the canvass as frequently as the manual suggests, so there are no leaking problems. Hybrid campers can be found at most camper and RV dealerships. For those interested, they should state very clearly that they want a hybrid. Sometimes they can be confused with RVs, so it’s important to look for the pull out beds, which are a marker for hybrid trailers. There are several models and brands of hybrid trailers, but there are those that stand out more than the others. Below are a few favorites. 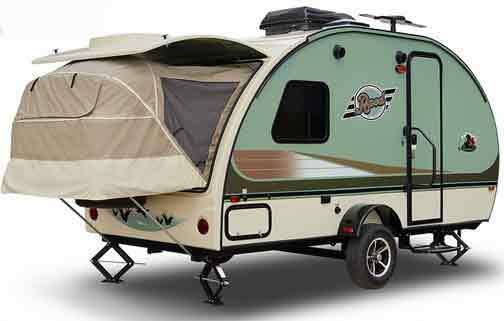 The R-Pod, by Forest River, is one of the smaller, more classic hybrid trailer options. R-Pod is proud of being able to offer the lowest tow weight for the price, with its RP-176T model having a GVWR of 3,778 pounds. However, this light weight doesn’t mean it’s small or cramped. In fact, the RP-176T has a length of over 18 feet and a width of 96 inches. And its interior is gorgeous, with faux marble counter-tops, beautifully tiled floor, and stunning wood accents. It’s the perfect hybrid model for a single person or couple to get out and explore, especially since it can easily be towed on the less travelled roads. 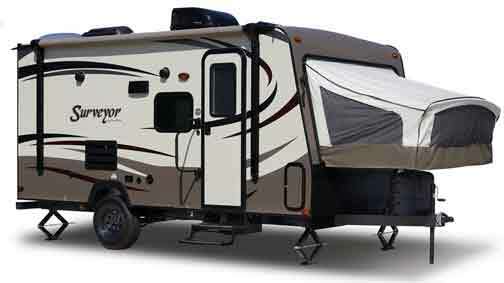 Roo Expendables, by Rockwood, also offer a line of nine hybrid camper trailers. Their line comes in several different floorplans and vastly varying weights, with the lightest having a GVWR of 3,854 pounds and the heaviest being 6,678 pounds. All are great options, but for the more adventurous, those who like to visit harder to reach places, the lightest one, simply named 17, is the best choice. 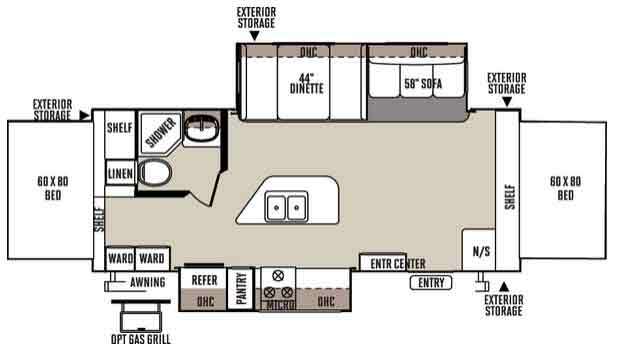 The 17 comes with a sizeable dinette, a small bathroom, and two large 60x80 pull out beds. It offers a three burner stove, double sink, and large refrigerator. And, the entire trailer is vacuum-bonded, making the structure extremely strong for its weight. Another hybrid trailer option is the Shamrock, by Flagstaff. This model comes with eight different floorplan options and several upgrades and add-ons are available. And while they do have a lighter trailer, also called the 17 and comes in at 3,854 pounds, for true comfort, campers should look to the 231KS. With a GVWR of 6,558 pounds and a length of 24’8”, it is truly a masterpiece. It has slide out beds on either side of the camper, with an option to have bunk beds. It has a large dinette and a comfortable sofa for extra seating. The kitchen is gorgeous, especially for a camper. It has an electric stove, overhead microwave, and a full fridge. Its large island offers extra counter space and extra storage. Finally, Surveyor by Forest River, also has a line of hybrid trailers. The three models weigh between 5,000-9,000 pounds, with the heaviest model, the 191T having a GVWR of 9,236 pounds. However, the truly unique design is the 224T, which instead of offering the typical two beds, offers three! And even with the third bed and the extra people that entails, there is still plenty of space in this gorgeous hybrid trailer. It has a spacious dinette, which is framed by a three cushion couch. The kitchen has a large sink, gas burners, and lots of storage space for dishes and extra food. Most importantly, the bathroom is lovely, offering a great alternative to campground facilities.